Product prices and availability are accurate as of 2019-04-24 02:59:26 UTC and are subject to change. Any price and availability information displayed on http://www.amazon.com/ at the time of purchase will apply to the purchase of this product. 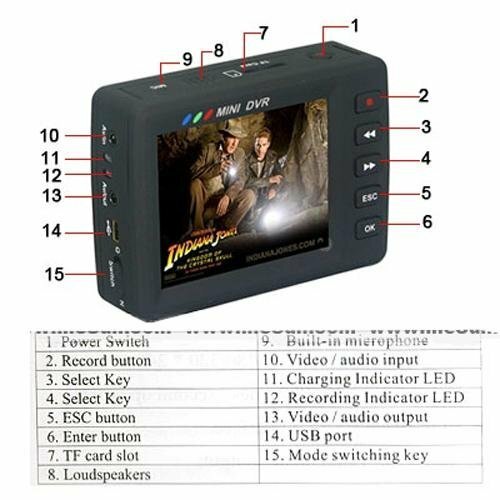 2.5 Inch LCD Screen:960 x 240 LCD Video Output Mode:NTSC / PAL Video Mode:NTSC / PAL Image Resolution:640*480 / 320*240 Play Format:MPEG-4 / AVI / ASF Frequency Range:20Hz - 20KHz Output Channel:Stereo Earphone Output:L2 0mW+R 20mW(16O)(Max Volume) Loudspeaker:1.5W Flash Memory:128MB Video Compact Format:MPEG-4 Memory Card:TF Memory Card IBM-PC:Windows 98SE.ME.2000, XP USB:USB 2.0 Language Selection:Chinese / English Power Adapter:DC 5V 2A Built-in Battery:Li-ion Battery 1800Mah Video Recording:? 3 Hours Player Equipment:? 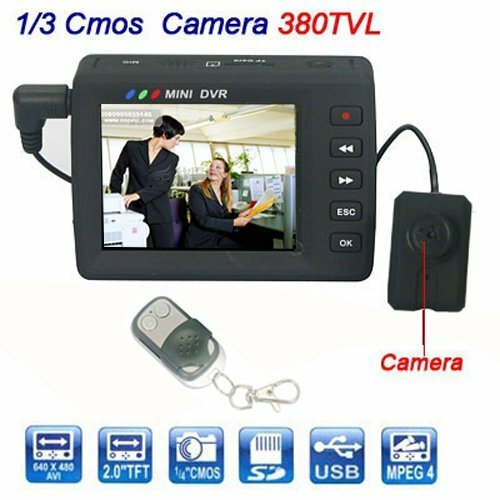 5 Hours maging Sensor:1/3 Inch CMOS Horizontal Resolution: 380TV Lines CMOS Total Pixels: 628 × 582 (PAL) 510 × 492 (NTSC) View Angle:62 Degree Safety Notice: 1. Do not use a damaged battery or charger. 2. Do not use battery charging time exceeds the allotted time. 3. At first the use of batteries or battery unused in a few months after the re-use, please fully charge the battery. 4. For the battery is fully charged, the use of its fully discharged, then re-charge in order to ensure its longer life. 5. At short-term use after the battery will shorten battery life, in thiscase, repeatedly for the battery is fully charged and then fully discharged several times, so you can use the battery a longer period of time. 6. Overcharging or excessive discharge will shorten the life of rechargeable batteries. When the rechargeable battery life than the use of a new rechargeable battery short time, replace the new rechargeable batteries. 7. Because of rechargeable batteries are consumables, so battery life will be shortened over time. 8. Careful not to let any conductor (such as necklaces, bracelets, etc.) to enable access to DC converter or a rechargeable battery side short-circuit, or may cause electric shock or fire. 2.5" TFT High Definition MINI Angel Eye Pinhole Spy Video DVR Detection Button Camera Cam Camcorder Recording System R W/ Remote Storage full over write automatically,Fast video recording by one key function,Recording, power ON / OFF via remote control. 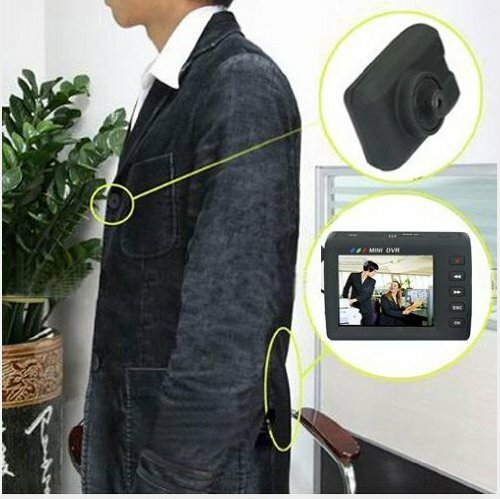 Rael time Display / Recording at 30fps with date and time stamp,960 * 240 high-definition 2.5-inch LCD screen.Built-in high sensitivity microphone recording. Support 8GB TF memory card,Video resolution: 640 * 480/320 * 240 optional,High-speed USB 2.0 interface,Audio and video input / output. Configuration removable high-capacity lithium battery, 5 hours of continuous playback, video recording up to 3 hours standby.